It's about to get seriously real in here! 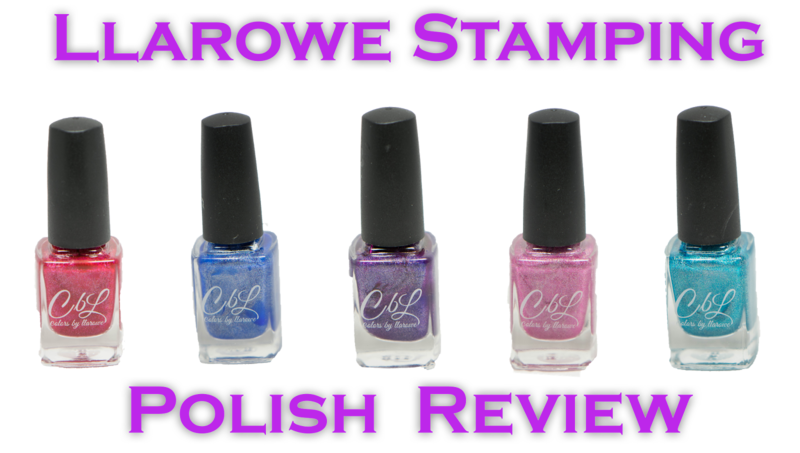 Today I have all 15 stamping polishes from Llarowe to share with you. This is going to be a massive post full of swatches and discussion. I was really surprised when I was contacted about these CbL stamping polishes because I didn't know they were in the works/being created. What's more when I was told the polishes would be across all kinds of finishes and colors I was super intrigued. I wanted to see what new offerings were going to be coming onto the market and so I accepted and threw my hat into the ring to try. Plus let's face it the CbL polishes are beautiful. I own a few myself from the main line so I knew they were going to be something else. So let's take a look these gorgeous polishes and see what innovations are coming now! As usual if you have any questions feel free to leave 'em in the comments below. For those that aren't familiar with CbL its an indie polish company that specializes in some of the most beautiful holos and special finish polishes I've seen. I own a few myself. This company also once upon a time made stamping plates most of which I also own. They were revamped maybe 2 years ago to make them a bit smaller for shorter nails, but are no longer being produced. More recently the company has moved onto creating stamping polishes with the aim of developing colors and finishes that were not common to what we have on the market. Today is going to be the first time I'm taking these polishes out for a spin. Just like my prior review I'm going to be swatching on stampers using images with both very thin lines and very thick lines so to that you can judge how well these polishes pick up. I'm also going to do a comparison to a few other stamping polishes I regularly use. For this review I'm using stamping plates from Messy Mansion's Leadlight Lacquer series. I reviewed these before (read here) and I know that the etching is excellent so this will not be an issue regarding pickup. For the stamper I will be using my old Winstonia Store marshmallow (white). This is the stamper I use if I ever ever have a plate that just won't pick up or struggles with polish. Why am I using this stamper? Because I don't want my swatches to be affected in any way by confounders like the stamping pad itself or the stamping plates themselves. For the black stamper I will be using my marshmallow 2.0 from the AE set I reviewed here. This one is not perfect, but has very reliable pickup. This way I can firmly say the polishes stamp as they stamp independent of all else save my technique as a stamper. First up none of these polishes stained my stamper. I was worried about that particularly for some of the reds (The Heart Bleeds) because they are incredibly bold but nope my stamper stayed white the whole way through! Now with regard to opacity it really varied. Some of these stamping polishes are so bold I was shocked. A good example would be Enchanted Forest and Lilac Petals. Others are so sheer they almost disappear into the stamper and do not show up well over lighter colors. That's the case for most of the lighter color holos here as you can see and the duochromes. Each of these polishes will double up as a regular polish so that you can both wear them and stamp them. They are thicker in formulation than most holographics and it's definitely NOT recommended to thin them out at all because if you do so they will lose their stamping capability. The nice part about the thicker formulation is that it means each of these polishes, except the duochromes are one coaters. Btw you may have noticed I changed the labelling for these swatches - you can find the plate name for each set of swatches at the lefthand bottom corner; for example the plate above is Leadlight Lacquer A01. These swatches were done in one scrape and one stamp pressing straight down. As always with my reviews I will not edit my swatch photos in any way save labelling and placement of the images. Oh boy here comes the part that would usually make me crazy. This is a make or brake category for me. Polishes that are opaque but dry fast make me want to scream in sheer frustration. Polishes that dry slow, but aren't opaque are equally bad. I'm always aiming for opaque and moderate dry time. That's my sweet spot so what about these polishes? These polishes dry fast. In general even regular holographic polishes tend to dry fast and challenging to use in stamping and watermarbles for that exact reason. So I was worried the minute I saw these. Because let's face it with enough skill its possible to make anything look good. I'm not saying that with ego, but if I didn't put up a review and never said a word about dry time how would you know the difference? Making pretty nail art is different from critically evaluating the materials you are using to make all that pretty. So how fast do they dry? I'd say they dry a littler faster than the Emily de Molly stamping polishes around 6-7 seconds and they definitely are no where near as slow drying as MdU. They are fast! Hayai! Rapido! Yeah they are almost the fastest drying stamping polishes I own save one other brand. So why don't I sound all put out of sorts and agitated? Well these polishes are weird. You may have noticed it in the tutorial that I put up, but as I stamped you saw the polishes really clung all around my nails and to the nail itself. I noticed it because generally my stamping polishes won't do that they just lay down flat as soon as I stamp and thats it. Instead these have some kind of odd "cling factor". Well that cling factor is pretty sweet! If you hold these polishes to your nail with the stamper while pressing a bit you get better transfer of polish that you think might be too dry to stick. It adds maybe a good 2-3 seconds on to their "dry time clock". But the trick is you are holding the stamper to your nail for those extra few seconds. And this allows for placement. So in total you have 6-7 seconds + an additional 2-3 seconds of cling for dry time. That's a little less than 9-10 seconds of total "dry time" so you need to be comfortable in that window. Ah the dreaded p word - placement. But its important because again I'm always thinking of my composition when I do nail art. I want the flower/stripe/heart/etc to be placed exactly so on my nail bed. It matters. As you could see in the prior tutorial as well I was able to do so using a CJS. So in short yeah these polishes allow for that magic to happen, but again within the previously mentioned window. So I probably overwhelmed you a lot here with these polishes. I was overwhelmed when I received them. So many polishes and so gorgeous I felt like smiling and crying at the same time. Lol. I like these polishes over all and some I absolutely love! What's stunning is that even though some of them are sheer they are all so beautiful as regular polish. In fact this is the first time I have ever encountered stamping polish that translates over so beautifully as regular polish too. Usually, in fact, I hate the 2 in 1's because inevitably the dry time is always way off with them. The cling factor here takes care of that. I'm actually the most pleased with the dry time. With regard to opacity I will admit I wish more of the colors were a bit more intense - well the lighter colors anyway. One thing though that is becoming clear to me as I try different polishes is that you cannot expect a holographic stamping polish to be as opaque as a creme based stamping polish. I've tried at least 2 brands now and I'm realizing that they just tend to be more sheer. So while I don't expect holo stamping polish to be as opaque as my creme ones I do want them to be as bold as the most bold polishes here over both white and black for example Turq'd or The Heart Bleeds . Overall I love the colorways - the most intense of these make me eyes roll back in my head! As in full blown stampingasm. They all become more bold when they are swatched over black/deep colors, and they all have exemplary dry time because of the cling factor. If these hadn't been sent to me for review I would have bought several to try because I don't own any stamping polishes like these. I also don't know of any other maker that has this many holos across the rainbow that stamp. In fact one of the most impressive aspects of this collection is that the range of color is so wide! And finally I will admit I love the fact that these function as regular polishes too so they are pulling double duty. I'll be honest and say they aren't perfect with regard to opacity and can be a bit sheer, but overall are beautiful and novel and will impress if you decide to buy. Each polish will retail for $10 USD or you can purchase the entire set of 15 for $150 USD. 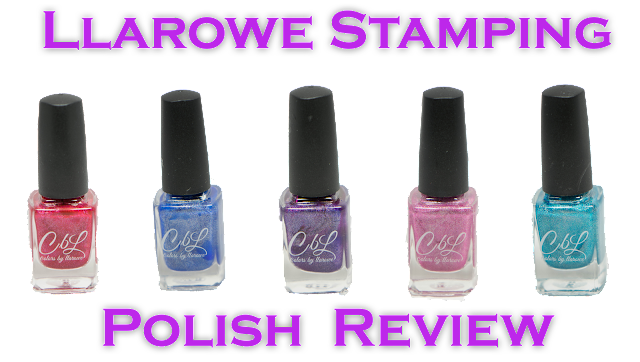 You can find CbL Stamping Polishes here. They will be releasing March 19th for preorder at 12PM MST. Love it! Thank you for the review!